ABS brakes, Active Cruise Control, Dual Zone Automatic Climate Control, Electronic Stability Control, Front dual zone A/C, Heated Front Bucket Seats, Heated front seats, Illuminated entry, Lane Keep Assist, Leather Seat Trim, Low tire pressure warning, Power moonroof, Power Sliding-Glass Moonroof, Remote keyless entry, Traction control. 27/36 City/Highway MPG Headquarter Mazda may be a brand-new dealership, but we come from a proven, family-friendly dealership background. We look forward to meeting you, showing you our inventory, and helping you drive off with a car you’ll love! ABS brakes, Active Cruise Control, Alloy wheels, Dual Zone Automatic Climate Control, Electronic Stability Control, Front dual zone A/C, Heated Front Bucket Seats, Heated front seats, Illuminated entry, Lane Keep Assist, Low tire pressure warning, Remote keyless entry, Traction control. 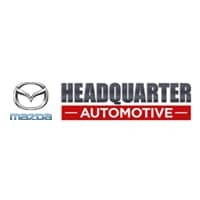 25/33 City/Highway MPG Headquarter Mazda may be a brand-new dealership, but we come from a proven, family-friendly dealership background. We look forward to meeting you, showing you our inventory, and helping you drive off with a car you’ll love! ABS brakes, Active Cruise Control, Alloy wheels, Electronic Stability Control, Front dual zone A/C, Heated Front Bucket Seats, Heated front seats, Illuminated entry, Leather Seat Trim, Low tire pressure warning, Power moonroof, Power Sliding-Glass Moonroof, Remote keyless entry, Traction control. 25/35 City/Highway MPG Headquarter Mazda may be a brand-new dealership, but we come from a proven, family-friendly dealership background. We look forward to meeting you, showing you our inventory, and helping you drive off with a car you’ll love! ABS brakes, Active Cruise Control, Alloy wheels, Electronic Stability Control, Front dual zone A/C, Heated Front Bucket Seats, Heated front seats, Illuminated entry, Low tire pressure warning, Remote keyless entry, Traction control. 26/35 City/Highway MPG Headquarter Mazda may be a brand-new dealership, but we come from a proven, family-friendly dealership background. We look forward to meeting you, showing you our inventory, and helping you drive off with a car you’ll love! ABS brakes, Active Cruise Control, Dual Zone Automatic Climate Control, Electronic Stability Control, Front dual zone A/C, Heated Front Bucket Seats, Heated front seats, Illuminated entry, Lane Keep Assist, Low tire pressure warning, Remote keyless entry, Traction control. 26/35 City/Highway MPG Headquarter Mazda may be a brand-new dealership, but we come from a proven, family-friendly dealership background. We look forward to meeting you, showing you our inventory, and helping you drive off with a car you’ll love! The new Mazda3 sedan is available for sale in Clermont, part of the wide inventory of reliable Mazda cars for sale at Headquarter Mazda. Available in three different Mazda3 trim levels, Sport, Touring, and Grand Touring package levels, the Mazda3 sedan brings Winter Garden drivers state-of-the-art technology features like Apple CarPlay™ and a stunning Active Driving Display. Our Mazda dealership in Clermont offers Mazda3 lease deals as part of our rotating set of new vehicle specials and national Mazda offers. Contact our Clermont dealership team to find the best Mazda3 lease deal to match your budget. Apply for financing on a new Mazda3 online then visit our showroom outside of Winter Garden to test drive a new Mazda car like the Mazda3 hatchback. To experience a new Mazda3 available for sale in Clermont, simply contact our Mazda dealership located just outside Winter Garden to find out more information for how to lease a new Mazda3 sedan today. Our Clermont dealership team is standing by, happy to help answer all questions you have about new Mazda cars and car financing in Clermont.